The WordFly Media library hosts files used in email and page designs. In this article we will cover how to upload, organize, and delete files in the media library. 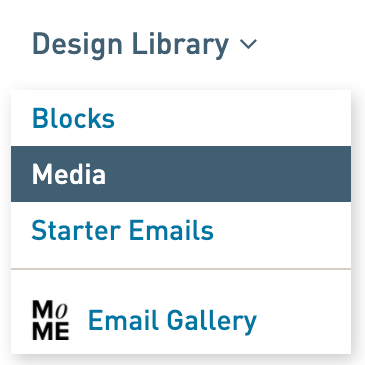 The Media library hosts files that can be used in your email and page designs. Files include images, downloadable files such as pdfs, and calendar files. Any files uploaded to the media library can be linked to in your emails and pages. Files supported are: gif, png, jpg, jpeg, pdf, and ics (calendar reminders). The maximum file size that can be uploaded is 2MB. Smaller files are best. Keep in mind, large files will take longer for recipients to download. There are a few folders that exist by default and cannot be deleted: emails, pages, editor, and your-files. The emails folder has a unique folder for each email template you build and holds all the media uploaded directly into the email. The pages folder is a unique folder for each page design (RSVP, Survey and Landing page) and holds both the code and images for pages. The editor folder has a unique folder for each custom starter you create for your email designs. And the your-files folder is a unique folder for each organization to use as needed to hold files. Create new media folders by clicking on the + next to the home icon. Upload files by clicking the upload arrow or drag and drop files on the upload arrow. Special characters are either replaced with safe equivalents or removed entirely. Move folders and files to other folders or the home folder by dragging and dropping but proceed with caution! Any moved media that is not re-linked with the updated file path will no longer display in a live email or page. Link directly to any files uploaded in the media library. Click on the name of the link and copy the URL. You can delete files in any folder but proceed with caution! Any deleted media will no longer display in a live email or page. When organizing your Media Library, we recommend creating unique folders for assets that will be reusable throughout many email and page designs. Copy the link to the media file and insert the link into the src field of your email or page design. This method allows you to easily overwrite an image in the folder if needed. For example, if your logo changes, you can easily upload a new logo into the logos folder which will overwrite the image wherever it has been linked across designs. Upload any of these file types to your the Media library: gif, png, jpg, jpeg, pdf, and ics (calendar reminders). The maximum file size that can be uploaded is 2MB. 1. Go to Design Library > Media. 2. 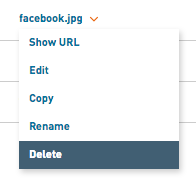 Select the upload arrow to browse to a file for upload or simply drag and drop your file on top of the upload arrow. 3. 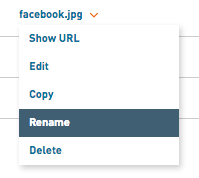 Rename a file name by clicking on the title and selecting rename. 1. Using the ‘+’ symbol next to the home icon to create a folder. 2. Type in the name of your folder and click the green plus button to the right or hit enter to create the folder. Easily drag and drop files you have already uploaded into folders. Or, open the folder by clicking the folder and selecting ‘open’ and then proceed to drag and drop images on top of the upload arrow or browse to files by clicking on the upload arrow. Drag and drop an existing folder into another folder. This makes the file you dropped into a folder the subfolder. 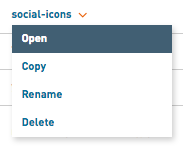 Or, in an existing folder, select the ‘+’ symbol next to the home icon to type in a new folder name. Click on the green plus button or hit enter to create the folder. This folder now resides inside of the existing folder. Note: Subfolders inside folders can be moved to the main media library area by dragging and dropping the folder on top of the home icon. Delete a single media file or an entire media folder anytime. If you deleted a media file accidentally please email us to see if the file can be retrieved. 1. In the Media library, click on any folder or file to see a list of options. 2. Select delete to remove the file. 3. Select "Yes" to permanently delete the files.